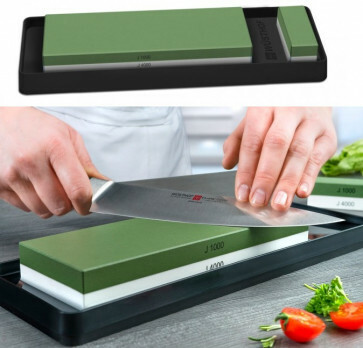 With the correct edge maintenance, high-quality knives will retain their sharpness for many years, ensuring that you will always enjoy using them. A particularly gentle and effective way of sharpening knives is to maintain their edge using a whetstone. WÜSTHOF whetstones consist of a high-quality combination of various abrasive grits. They are fired in a special process lasting 14 days. This gives them their special resistance to ensure a very long service life. The innovative and practical holder holds the stone firmly in position, ensuring optimum stability and safety when sharpening. The particles created during grinding are collected in the holder, keeping the worktop clean. Sprinkling a little water on the stone produces the necessary particles for efficient sharpening to take place. Super fine grain (J1000 / 4000).